What you’ll basically need is a soft pouch similar to what you can see in the picture above. 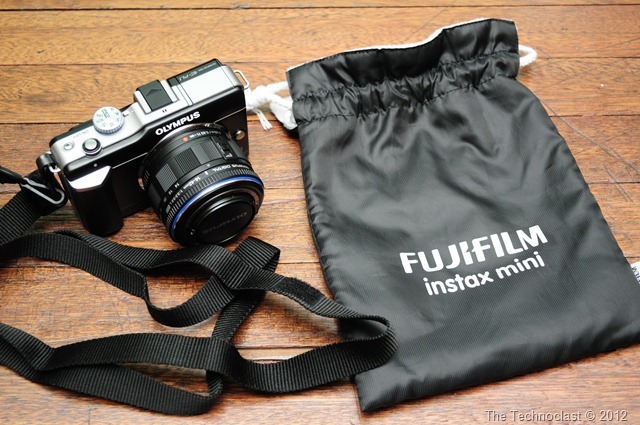 I got mine from a local Fuji Instax store at The Collective in Makati for PHP 200. (About US $4-5) Next, you’ll need a detachable strap from an old pouch or bag that fits your size – preferably with no brand markings and stuff. Finally, some double side tape and some velcro should finish up the DIY part of the carry system. What you’ll end up with is a simple, pocketable case that’s capable of quick deployment when you want to take pictures. Watch the video below to see it in action. Now, the best part about this system is that it should be able to adapt in a multitude of shooting philosophies. You can take the Fuji bag and stuff it in your regular sling and you’ll have it protected without carrying a dedicated camera bag. You can detach, reattach, and adapt the system to your tastes, or you can even clasp it onto your bag and other forms of carrying styles. What I like about it best is that it allows me to shoot faster, while still able to keep a low profile when I want to. And hopefully, you found an idea or two there that you might want to adopt for your own style as well.